We’ve just spent 5 days in Reunion Island and more specifically in the town of Saint Pierre. I had some teaching to do with degree-level students at the IUT. 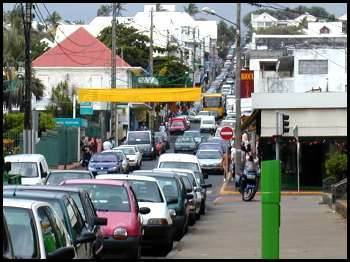 Saint Pierre is exactly like in the picture : the roads are steep and full of cars :-) The food is rather excellent and we really love the carri ti-jacques boucanÃ© and the rougaille saucisses. By the way, we laughed a lot yesterday when we realised that Anya’s first experience of public transportation is in fact the ATR-42 she took on Sunday !